Larry Juanarena was born on May 3, 1932, in Chico, California. He enlisted in the U.S. Air Force on February 2, 1950, and was trained as an aircraft mechanic and B-36 Peacemaker crew chief, serving his entire enlistment with Strategic Air Command at Castle AFB, California, Carswell AFB, Texas, and Loring AFB, Maine. 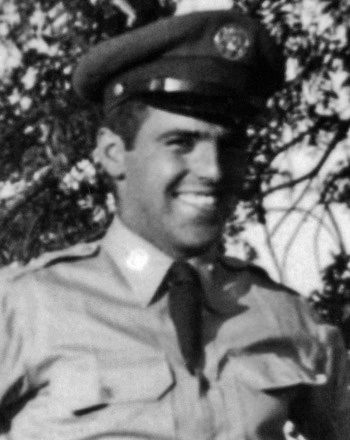 SSgt Juanarena left active duty on May 30, 1955, and later owned and operated Pat n' Larry's Steakhouse in Chico, California. He often threw fundraisers for military families, POWs, veterans, and soldiers. Larry Juanarena died on June 6, 2010, and was buried at the Chico Cemetery in Chico, California. Larry and his wife, the former Patsy Lou Dutton, were married from 1974 until her death in 2009.